This picture was taken in Toronto, Ontario, Canada 1916 but there is an Wick interest here. Front Row: left to right: Christina (Teenie) Miller nee: Miller - she was the wife of Nigel, Robertson Miller who was killed 6 April 1916, WW1, France. She returned to Wick directly after his death and I believe stayed with her parents at 43 Wellington St. Wick. She took her two sons Alexander and David Miller with her. She did return to eastern Canada and married a Mr. Gribble. 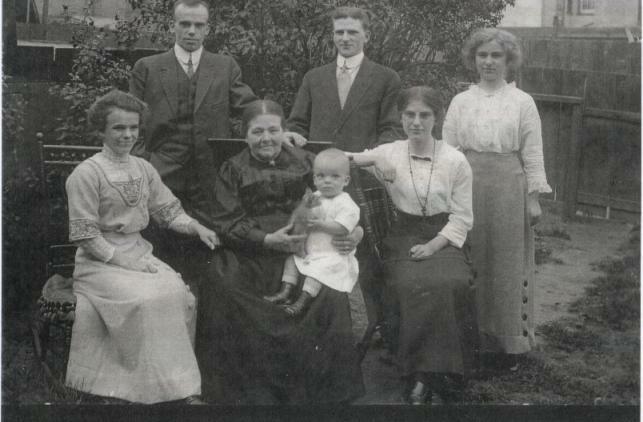 Am looking for anyone who knows of her parents and family, my g. grandmother Margaret Miller nee: Angus holding the son of Nigel- David Miller, Christina, Smith Wares: nee: Miller.